This isn’t your everyday breast cancer shirt. Every year Baseballism rallies the fight against breast cancer, this year with an updated shirt that screams support! 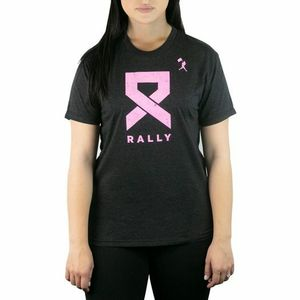 But rather than wanting you to buy this for looks, we here at Bases Loaded highly recommend this shirt because 20% of all the proceeds for every single purchase made from the Rally Ribbon Women’s T-Shirt goes straight to the Breast Cancer Research Foundation. Whether your family has been tragically affected by this or not, rallying for this fight has never been easier than with the Baseballism Rally Ribbon Women’s T-Shirt. -	Vintage Baseballism Bat Screened on Back Right.